Play Seven Card Stud Poker Online in U.S.A. Seven Card Stud used to be a fixture at casinos in the United States, particularly on the East Coast, but with the rise of Texas Hold’em, this card game has largely fallen by the wayside. 7 Card Stud poker is still common in private, offline poker games especially in those dealer’s choice home games where the person with the button gets to choose the poker variant to play. If you’re a poker fan, then you probably already know how to play 7 card stud, and you may be wondering where you can find 7 card poker games online. International players have access to the sizeable liquidity at PokerStars, 888poker, and other large card rooms, but it’s a bit trickier to find online poker sites that are open to Americans and spread 7-card games. In order to actually play more than a trifling number of hands, you have to be prepared to sit at whatever stakes are running rather than focusing on a particular level of antes and bet sizes. It’s also helpful if you’re willing to table start and play heads-up in order to entice others to join. It’s practically impossible to play 8, 12, or more tables at a time like NLHE grinders do, but this is just as well: You probably can’t accurately keep track of dead cards at more than three or four games at once anyway. Finally, if you can play both Seven Card Stud Hi as well as Hi/Lo, your opportunities will expand significantly. We here at Professional Rakeback have carefully examined the lobbies of the major U.S.-friendly poker providers to identify those that not only list stud games in their lobbies but actually attract active players. We’ve conducted our observations at many times of day, during weekdays and weekends, so that we can present you with true information about how often 7-card games actually run and at what stakes. The Winning Poker Network, of which Americas Cardroom is the most prominent skin, is the best place online for 7 stud in the U.S.A. Between stud hi and stud/8, there’s almost always a table running with as many as seven or eight games going at once during peak hours. Traffic patterns seem to favor the split-pot version of 7 card stud poker by about a 4:1 margin. These card games occur at wildly disparate betting levels, including micros, small stakes and high stakes. Indeed, during our research, we recorded a moment when there was a 1,000-fold difference between the lowest and highest game running. That is, a $0.04/$0.08 table was going at the same time as a $40/$80 game. The upper echelons tend to feature shorthanded play with maybe four or five players receiving cards whereas it’s common to see all eight seats occupied in the smaller games. When you open up a new account and make a deposit at ACR, you’ll get a 100% up to $1,000 bonus that gives you 20% cash back on your rake and tourney fees. You can get 27% straight rakeback on top of this. You’ll also receive $50 free to use on whatever games you'd like, including seven card stud. 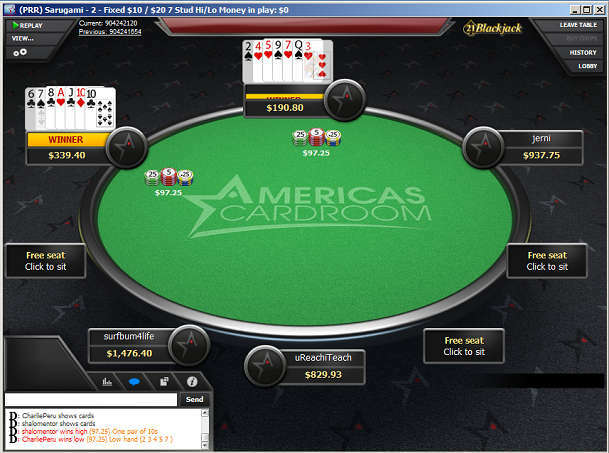 Read our Americas Cardroom review to learn more. The descendant of the first Bitcoin-only poker room, Seals with Clubs, today’s SwCPoker is something to keep on your radar if you’re a 7 card stud poker player. This is despite the fact that there’s hardly ever a game running in stud formats and overall traffic is pretty low. SwC is the only site that accepts American customers and offers Razz: seven card stud played for low. 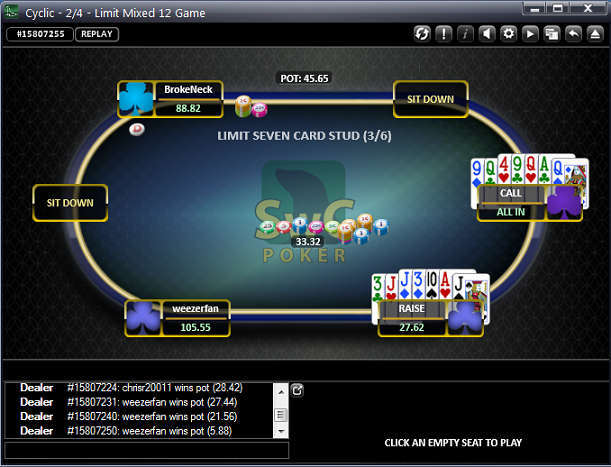 You might not get a chance to play much straight stud, but all three of the 7 card stud poker games (Hi, Hi/Lo, and Razz) are featured in the mixed games, like 12-game, that do run at times. Dealer’s Choice is available at SwCPoker, so you can join a table and select stud whenever it’s your turn to choose. Through a unique “Request Action” button it’s possible to broadcast a message through the site’s chat asking people to join you at a table, so there’s still hope even if your table is deserted when you first sit down. There’s no first deposit bonus at SwCPoker, but through its Krill rewards program, you can get up to 50% rakeback depending on your lifetime volume of play. Browse over to our SwCPoker page to get more info. There are some indications that stud-like games were played as early as the Revolutionary War, perhaps using only three or four cards to a hand, but these bear little resemblance to modern seven card poker. Historians conclude that stud first entered the mainstream during the Civil War although each player got only five cards per hand during this time. It quickly grew in popularity, but was stymied by a 1910 California ruling that draw poker was a game of skill and therefore allowed whereas stud was dependent wholly upon chance and prohibited. We can see that a lack of understanding of gambling games among the authorities is not a recent phenomenon. Whatever the rationales for this decision were, it impeded the growth of stud poker at least until 1931 when Nevada became a wide-open gambling state..
Up until this time, when people spoke of stud, they were referring to the game with 5 cards. But sometime before World War II, the 7card variant was introduced, and it spread rapidly, aided by the efforts of fans among the U.S. servicemen deployed around the world. In the decades following the war, it became the dominant type of poker. It retained this position until the 1980s when Texas Hold’em began to become the standard first for tournaments and then for side games.